Solar panels for homes are generally hard, solid structures that require mounting. SoloPower, a company that makes thin film solar panels, has broken the mold with durable flexible panels. The company has received the first every UL Certification for their flexible, CIGS modules.SoloPower’s UL certification was a first for the PV solar industry. Governor Arnold Schwarzenegger praised the California based company for their achievement with their flexible, CIGS solar modules. SoloPower’s thin-film modules were tested to the standard UL 1703, the safety standard for all PV module manufacturing. 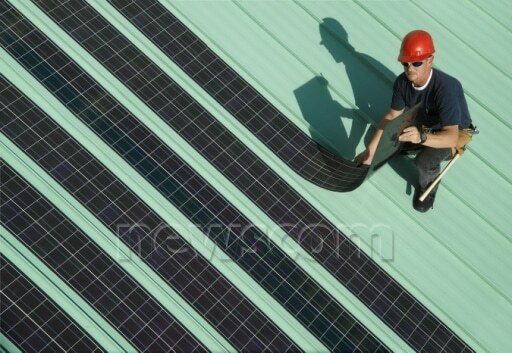 Their extremely thin, yet durable, solar strips not only passed the testing but also was pushed to meet more stringent interal standards for safety and effectiveness. Dr. Rommel Noufi, Principal Scientist of the National Renewable Energy Laboratory, was excited to see the company achieve the UL certification. The thin-film solar panels are an important step forward in enabling more homes to go solar. Thin-film panels are more light-weight and come at a lower cost than the typical rigid panels. The panles are being introduced to Europe and North America currently, with plans to expand as the need increases. As the demand for solar panels continues to exceed manufacturers abilities, it is great to see an additional option on the market to help more homes go green.